We all know smoothies are a healthy and convenient way to get more fruits and green vegetables into our diets. Berries, bananas, greens, and yogurt are healthy mainstays of smoothie making. But today I’m sharing seven superfood ingredients you can hide in your smoothie to add an even bigger boost of nutrition. And, what’s more, no one will suspect a thing! Stay with me, here. Yes, you absolutely can add liver to a smoothie and not taste it. Pinky promise. I’ve done it multiple times and the kids didn’t suspect a thing. Liver is one of the most nutrient dense foods on the planet, with three times more iron than red meat, more folate than leafy greens, and more vitamin A than any other food! These nutrients are important for oxygenation of the blood, energy usage, fetal development, thyroid function, immune function, and more. 1 tsp per serving. It doesn’t sound like much but, due to its nutrient density, a little goes a very long way! I buy my livers fresh, blend them in a bowl with an immersion blender, then freeze in an ice cube tray or in small scoops, similar to Tiffany’s method for freezing tomato paste. The frozen balls can be tossed straight into the blender when making a batch of smoothies (I typically blend at least three servings of smoothie at once, so 1 frozen ball is perfect). Here are more ways to sneak liver into your family’s food without anyone knowing! And if you like liver, you’ve got to try this amazing pate recipe! Demonizing egg yolks is so last century. We now know that cholesterol and saturated fat are actually healthy and assist in hormone balance and immune function. Similar to liver, egg yolks are also rich in fat soluble vitamins – namely, vitamins A and D. Some omega-3 is also present in the yolks, especially if the hens have been raised on pasture. 1 yolk per serving. 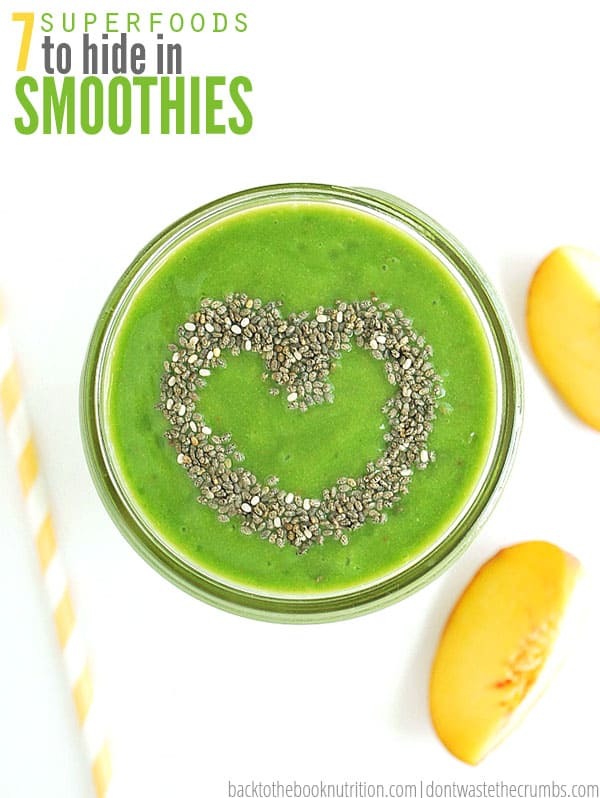 In addition to the nutritional benefits, it adds a super creamy texture to your smoothie! Plus it’s one of the key ingredients in an Eggnog Smoothie! I would caution against consuming raw egg if you aren’t purchasing pastured eggs from a farmer you trust. I buy my eggs from a local farmer whose farm we’ve visited and whose methods we’ve observed ourselves. Elderberries have more vitamin C than blueberries or raspberries, and have been shown to shorten the duration of flu symptoms by a few days. I make my own homemade elderberry syrup in about 15 minutes, using 3 ingredients, and it costs 75% less than store bought! It’s something my entire family takes at the first sign of sniffles and sneezes, and we’ve noticed a significant difference in how quickly we can kick a cold when I make it! 2 Tbsp per serving. The flavor would blend best in a smoothie that uses other berries. Elderberry syrup can also be added to popsicles – here’s a recipe for Elderberry Juice Pops that my kids LOVE! To save money, I stock up on dried elderberries during the warmer months – prices go up by 50-100% once flu season hits. Milk kefir – especially if you’ve cultured it yourself at home using Tiffany’s easy tutorial – has a higher concentration of beneficial yeasts and probiotic bacteria than yogurt. One study estimated 1.5 billion colony forming units (CFU’s) of probiotic bacteria per tablespoon! The lactose content of traditionally prepared kefir is also considerably lower than milk, so it tends to be better tolerated than milk by those with lactose intolerance. Of course, water kefir can also be used. 2-4 Tbsp per serving. If you are unaccustomed to consuming probiotic rich foods, you may want to start with 1/2-1 Tbsp and increase gradually. Preparing kefir at home will save you money (at least 50%) since you only purchase the kefir grains once, and then just add milk each time you make a fresh batch. If you have a friend who makes their own kefir, ask for some of their extra grains to start your batch at no cost! Obviously, adding chocolate to a smoothie will change the color and flavor so please excuse me for including it in this list of hidden superfoods. 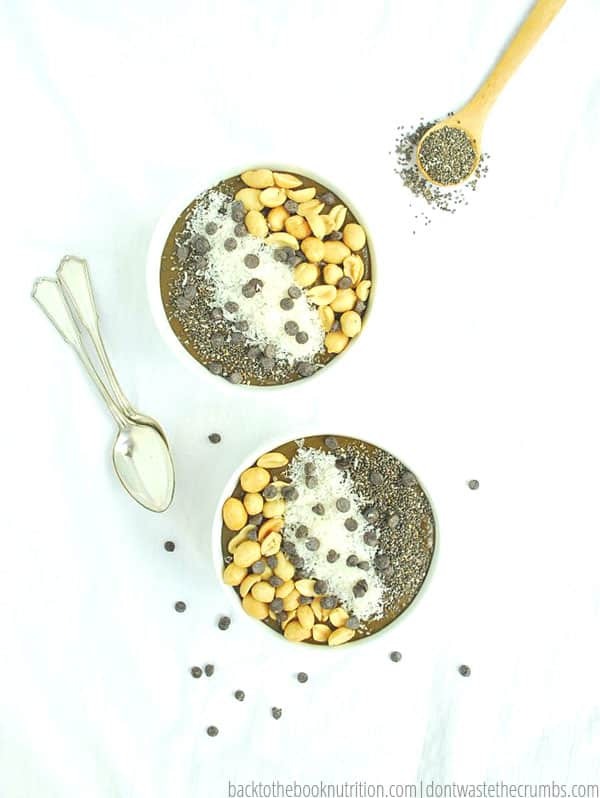 I guarantee, no one complains when I serve Chocolate Peanut Butter Smoothie Bowls for breakfast! Raw cacao is cocoa powder that hasn’t been alkalinized with chemical agents. Because of this, it contains a dramatically higher concentration of antioxidants than Dutch processed cocoa – even higher than strawberries, raspberries, or cherries! Cacao also provides some extra fiber and minerals, including magnesium, which many of us are lacking in our diets. Raw cacao is definitely more expensive than your average Dutch processed cocoa, but I like that the nutrition hasn’t been compromised through alkalinization. The flavor of raw cacao is also much stronger so you can use less of it than you would a Dutch processed cocoa. Coconut milk offers similar health benefits to coconut oil – it’s rich in medium chain triglycerides (MCTs), which are an easily metabolized form of fat (more likely to be burned, not just stored). Studies show that the fat in coconut milk (and oil) aid in heart health, blood sugar control, weight management, and skin aging, just to name a few! To save money (and avoid harmful dairy additives), you can make your own coconut milk at home. The texture is slightly different than store-bought, but you won’t notice it in the finished smoothie anyway. Whole chia seeds are a great source of fiber and ALA, which the body converts to healthy omega-3 fatty acids. It’s not as potent a form of omega-3s as you’ll get from eating fish or taking cod liver oil, but it’s healthy nonetheless! I love adding them to smoothies because they’re flavorless, and don’t need to be ground like flax seeds do. 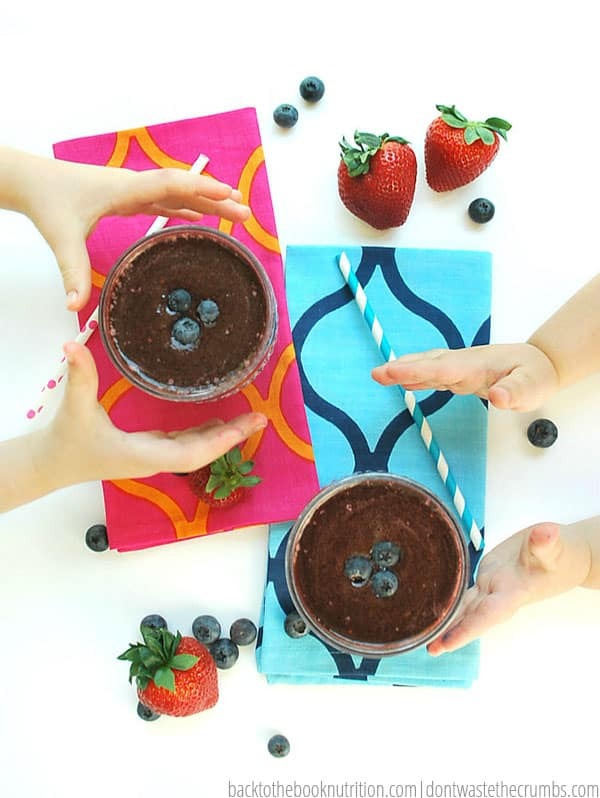 The kids really like chia in their smoothies, so I don’t always need to hide them – in fact, they often request I add a chia seed design on the surface! All of these superfood additions would be great if you wanted to try 5 Day Smoothie Fast. You can also add more protein to your smoothies without the scary powders High Protein, No Powder! 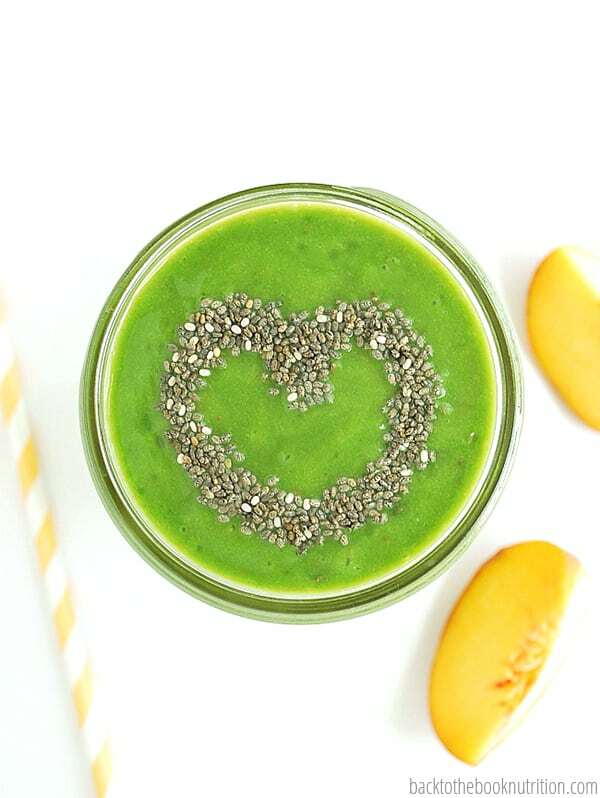 What superfoods do you hide in your smoothies? You’re so right, Jennifer – a video tutorial would have been great! To answer your question, yes, I do use raw livers. The best method I’ve found for pureeing them is to place them in a quart size mason jar, then use the immersion blender. I sometimes have to add some of the juices from the container or a little water to help them along. I don’t mind leaving a few lumps here and there since they’ll smooth out a little more with the other smoothie ingredients when I toss them into the blender (or not be noticed if I’m adding it to something like meatballs or chili). If you’re not comfortable with raw liver, I suppose you could try gently cooked/steamed livers, then puree them (I would guess you’d need to add water to help them puree smoothly). Or, you could add desiccated liver powder, which would be even easier but may cost you more. Thanks for the list. We have tried Elderberry multiple times when kids get sick but it has the most awful taste. I will look into your homemade version. Hi Dena! I was wondering, can you recommend any smoothie blends that you used to mask the liver taste? You’ll have to experiment a little based on your own tastes, but I find the stronger flavored fruits like blueberries and blackberries work best. As for greens, kale would have a stronger flavor so might help mask the flavor some too. Hope that helps!